Ribosomes are tiny spherical organelles that make proteins by joining amino acids together. Many ribosomes are found free in the cytosol, while others are attached to the rough endoplasmic reticulum. 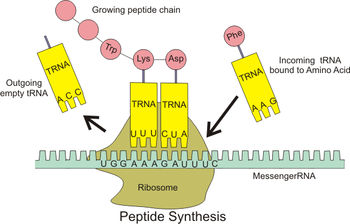 The purpose of the ribosome is to translate messenger RNA (mRNA) to proteins with the aid of tRNA. In eukaryotes, ribosomes can commonly be found in the cytosol of a cell, the endoplasmic reticulum or mRNA, as well as the matrix of the mitochondria. Proteins synthesized in each of these locations serve a different role in the cell. In prokaryotes, ribosomes can be found in the cytosol as well. This protein-synthesizing organelle is the only organelle found in both prokaryotes and eukaryotes, asserting the fact that the ribosome is a trait that evolved early on, most likely present in the common ancestor of eukaryotes and prokaryotes. Ribosomes are not membrane bound. Ribosomes are composed of two subunits, one large and one small, that only bind together during protein synthesis. The purpose of the ribosome is to take the actual message and the charged aminoacyl-tRNA complex to generate the protein. To do so, they have three binding sites. One is for the mRNA; the other two are for the tRNA. The binding sites for tRNA are the A site, which holds the aminoacyl-tRNA complex, and the P site, which binds to the tRNA attached to the growing polypeptide chain. Peptide synthesis by a ribosome. : The ribosome assembles amino acids into a protein. The specific amino acids are controlled by the mRNA sequence. This is required by all living cells and associated viruses. In most bacteria, the most numerous intracellular structure is the ribosome which is the site of protein synthesis in all living organisms. All prokaryotes have 70S (where S=Svedberg units) ribosomes while eukaryotes contain larger 80S ribosomes in their cytosol. The 70S ribosome is made up of a 50S and 30S subunits. The 50S subunit contains the 23S and 5S rRNA while the 30S subunit contains the 16S rRNA. These rRNA molecules differ in size in eukaryotes and are complexed with a large number of ribosomal proteins, the number and type of which can vary slightly between organisms. The ribosome is the most commonly observed intracellular multiprotein complex in bacteria. Ribosome assembly consists of transcription, translation, the folding of rRNA and ribosomal proteins, the binding of ribosomal proteins, and the binding and release of the assembly components to make the ribosome. In vivo assembly of the 30S subunit has two intermediates (p130S and p230S) and the 50S subunit has three intermediates (p150S, p250S, and p350S). However, the reconstitution intermediates are not the same as in vitro. The intermediates of the 30S subunit yield 21S and 30S particles while the intermediates of the 50S subunit yield 32S, 43S, and 50S particles. The intermediates in the in vivo assembly are precursor rRNA which is different from in vitro which uses matured rRNA. To complete the mechanism of ribosome assembly, these precursor rRNA gets transformed in the polysomes. All prokaryotes have 70S (where S=Svedberg units) ribosomes while eukaryotes contain larger 80S ribosomes in their cytosol. The 70S ribosome is made up of a 50S and 30S subunits. Ribosomes play a key role in the catalysis of two important and crucial biological processes. peptidyl transfer and peptidyl hydrolysis. ribosome: Small organelles found in all cells; involved in the production of proteins by translating messenger RNA. translation: A process occurring in the ribosome, in which a strand of messenger RNA (mRNA) guides assembly of a sequence of amino acids to make a protein. Svedberg: The Svedberg unit (S) offers a measure of particle size based on its rate of travel in a tube subjected to high g-force.